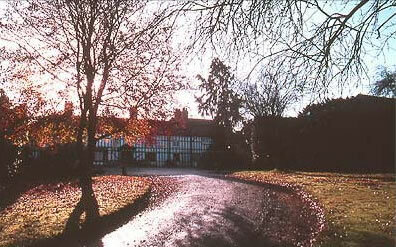 Is Shropshire's Fitz Manor haunted? Situated in the heart of rural Shropshire and overlooking the River Severn, Fitz Manor, is an Elizabethan Grade II listed building, which has a rich and varied history. The existing building dates from 1450 but the original structure is thought to have been a Saxon Hall. The first written records date from the 12th Century where it was recorded in the Doomsday Book. Since the 18th Century the Manor has been in the hands of the Baly family who now run it as a successful bed and breakfast. By far and away the most famous tale, is that of a priest who was actually crucified in the corner of the dining room for being a homosexual. His spirit continues to re-visit the scene of his gruesome death and likes to make himself known by banging on furniture. The figure of a lady in a white dress is also seen in the "red" room and also outside the house. She's seen running along with her skirt pulled up slightly, so as not to trip. Another resident spirit is that of Edward Baly whose spirit has been picked up on in the orange room (yes, all the rooms are named after colours!). The scent of pungent tobacco smoke is very often reported in this room, more than likely from the tobacco Edward used to personally import from abroad.